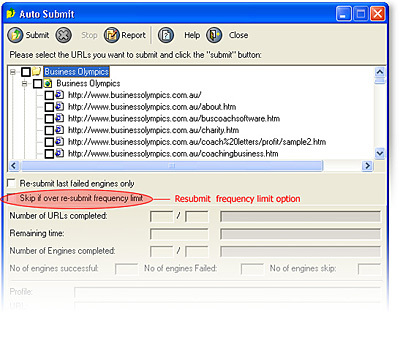 This feature exist to protect you from accidental spamming of the search engines. However some people have special requirements and wish to turn it off. You can simply uncheck the option indicated in the screenshot below to turn it off. If you can not see that option as it is shown in the screenshot, please follow the instruction below to update your program. Updating Dynamic Submission to the latest version should solve this problem. Save this file into your Dynamic Submission's program directory to overwrite your existing "ds.exe" file. Restart the Dynamic Submission Software. If you still have any problem, please send us the "Error.log" file located in the Dynamic Submission's program directory to us and we will check it out for you.